In this blog post we’ll cover our plans for taking us through the next stage of our Early Access voyage. So far, we have created three Major Updates which have significantly improved the game, and we intend to keep working on more to make Abandon Ship as good as possible before we enter full release. At a high level, we’re going to continue creating Major Updates, but as per Major Update 3, we’ll unlock regions as well as add new systems. Some of these new updates will advance the main story, and we’re planning on doing another one, possibly two standalone ‘Abandon Ship Stories’ before full release. Our current thinking is that the next one of these would be part of Major Update 5 and centre on the Cult. As for our timeline, we originally estimated we would be in Early Access for 9-12 months, with the usual caveats of that being subject to change. Back then, we had no idea how successful Abandon Ship would be – we certainly didn’t expect to hit 4th in the world the night we launched! That success has enabled us to work on everything we’d love to put in the game, but of course with a team of three people, that takes time. Our current estimates put release some time in Summer 2019, but we will of course update you as we hone in on this. Aside from the top-level goals described above, here are some of the things that we’re planning to tackle during the remainder of our time in Early Access. The usual caveats apply – development is a moving target and we may re-arrange priorities as we need to – some of these tasks may not happen if we deem them as something that doesn’t add appropriate player-value. It’s also a list that we’ll undoubtedly add to, and should be considered non-exhaustive. 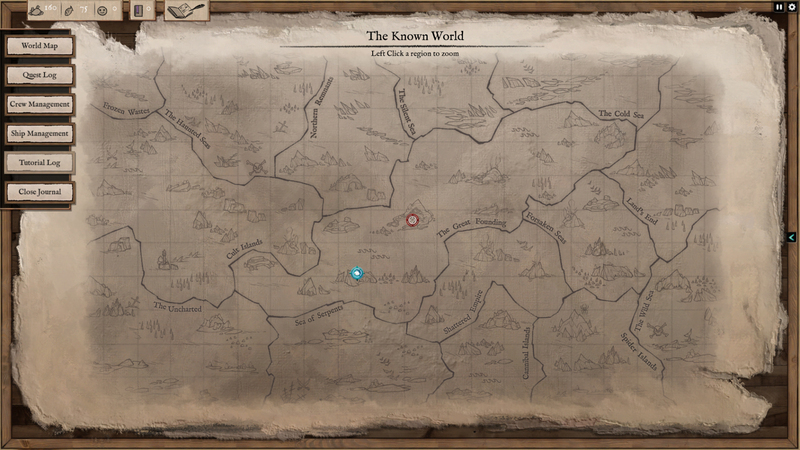 We’ve reworked the World Map to accommodate some upcoming content. – A special island that once you perform an event there will clear the rest of the fog of war, aiding navigation. – An upgrade that shows nearest points of interest under the fog of war, providing more of a sense of direction when exploring. – A resource that ticks down as you move round exploration maps, which can be re-stocked at special islands and ports. Running out of this resource would negatively affect morale, and there would be some choice to make that will impact the expenditure of this resource, all providing more moment-to-moment choice. – A new biome (we would merge the existing islands in the Sub Tropical Biome into the Tropical one as these are very similar). The new biome would be more of a Mediterranean vibe. – Every map containing a unique island, providing more of a sense of discovery. – Every map containing a unique event/side-quest to complete, increasing variety. – Making some of the player choices feed back into the game, so their decisions may come back to haunt (or help) them. – More combat modifiers, particularly environmental ones or ones based on the region you are in. New weapons and upgrades that we’ve released as part of previous Major Updates have really added to the game. – Provide a bonus to having maximum morale. Lifeboat and Stranded modes need to have some decision-making that impacts the chances of rescue. – A Freeplay mode that has a long-term goal. – Translations. Russian and Brazilian Portuguese look like they will be ready first. Simplified Chinese, Spanish, Dutch, German and French languages are in-progress. These translations are done by our community, so there may be some time between major updates and the new text being completed. There are also a few other cool things we’re toying with that we’re not ready to talk about yet, although they are early ideas at this stage! It was always our goal to be one of those games that treat Early Access in the right way by listening to player feedback, engaging with the community and making significant progress on the game. Thanks for all the comments and posts that show we’re on the right track. It’d be great to know your thoughts, and if you like what we’re doing, please let us know by leaving a Steam Review.